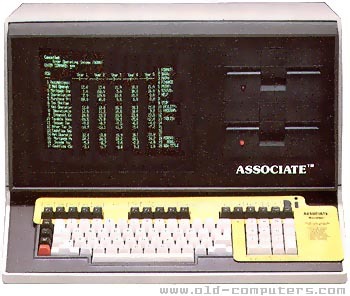 The Associate system was no more or less than a typical integrated CP/M based system. Built for a professionnal use, it offered an anti glare screen, a robust keyboard and either dual floppy disk or hard disk configurations. To distinguish itself from multiple competitors offering the same hardware configurations, D.T. Industry proposed a full software package called Solutions, for free. It included the CP/M operating system, Spellbinder word processor, Microplan SpreadSheet and an accounting software. Each software was delivered with a special keyboard overlay (see the yellow Microplan template on the picture). see more Data Technology Industries Associate Ebay auctions !